Belkin's G Plus MIMO delivers nearly-as-good performance as Pre-N, for a third less dough. When MIMO wireless networking equipment first appeared in late 2004, it improved spotty coverage and speeded up slow networks. But MIMO gear remains costly compared with the price of standard Wi-Fi routers and client cards. Now, our tests show that new bargain-priced MIMO products from Belkin deliver performance that's almost as good as that of more expensive alternatives, at two-thirds of the price. In our testing, Belkin's Wireless G Plus MIMO products (a router and a PC Card) transferred data just slightly slower than the average (see the chart below) for Belkin's pricier Wireless Pre-N router, which earned a Best Buy in our August roundup of new Wi-Fi products. At 100 feet and through several walls, both the Pre-N and the G Plus devices exhibited a noticeable drop-off, with the G Plus's 9-mbps throughput again trailing the Pre-N's results by 2 mbps. 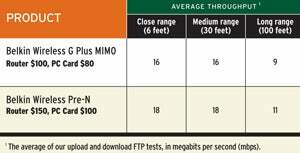 But when you consider that no conventional 802.11g network gear we've ever tested has even completed our FTP transfer test at 100 feet, the G Plus equipment's performance is impressive. All of Belkin's MIMO products have two built-in radio transmitters, but its Wireless G Plus MIMO router contains only two radio receivers--one fewer than the Wireless Pre-N routers have. The $100 G Plus router costs about a third less than the $150 Pre-N router. The company's $80 Wireless G Plus MIMO PC Card contains three receivers--the same number that the $100 Wireless Pre-N PC Card has. Belkin's Wireless G Plus MIMO line will have some competition soon: Linksys has announced products based on the same Airgo chips Belkin uses in the G Plus. Though these new MIMO products cost less than their predecessors, you may not need to fork over even that much for Wi-Fi. Belkin's own 802.11g routers cost $50 to $70, and standard 11g network cards will set you back about $40 to $50. Older products may well do the job for you (especially if you use your network primarily to share broadband Internet access, which typically peaks below the maximum throughput of standard 11g equipment). But if you need more throughput within your network, or if you're attempting to cover an annoying radio dead spot, the G Plus can give you a performance kick without a corresponding hit to your wallet. Belkin's new Wireless G Plus MIMO gear delivers most of the speed and range of its pricier Wireless Pre-N products. How we test: We tested each router and corresponding PC Card in a series of short-range, medium-range, and long-range tests conducted in a real-world suburban home. In the close-range tests, the router was set up in a home office with the client set up approximately 6 feet away in the same room. 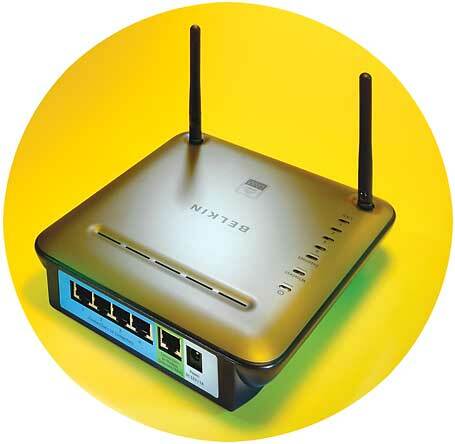 In the medium-range tests, the router remained in the office while the client was moved two rooms away. All doors were closed and a wall of metal filing cabinets stood in the path of the signal. In the long-range tests, the router remained in the office while the client was set up in the backyard, about 100 feet away. Our server test bed, which connected to the router via ethernet, was a 3-GHz ABS Pentium 4 system running SuSe Linux 9.2. Our client test beds were five identical IBM ThinkPad T52 notebook PCs; though each notebook would normally ship with an internal Wi-Fi card, IBM removed them for our testing purposes. Our standard 802.11g client test bed was a Toshiba Tecra M3. We ran a script that contained a series of tests. We uploaded and downloaded a 48MB file using the Windows FTP client. We used Windows ping to measure the average response time (aka latency) between the client and the server on a pass of 40 packets of data. We also measured the number of lost packets. We ran our tests multiple times over several days.